In Spectrem Group’s study How Financial Advisors Can Increase Client Satisfaction and Loyalty, it is found that a satisfied client does not mean they will follow the investor wherever he or she goes. Based on wealth segmentation, 60 percent of Ultra High Net Worth investors (with a net worth between $5 million and $25 million) said they would move with the advisor, while 53 percent of Millionaire investors (with a net worth between $1 million and $5 million) would move, and 50 percent of Mass Affluent investors (with a net worth between $100,000 and $1 million) would stay with the advisor. A sign of loyalty would be the willingness to recommend an advisor to others. However, according to the Client Satisfaction and Loyalty study, only 32 percent of investors said they were “extremely likely’’ to recommend their advisor to someone they know, and another 29 percent said they were “likely’’ to do so. That leaves 39 percent who either were not sure they would recommend their advisor or relatively certain they would not. Client satisfaction for financial advisors is 73 percent overall, according to the study. It reaches to 80 percent among the wealthiest clients, and ranges up among older clients, and those who are most dependent upon their advisor for financial decisions. 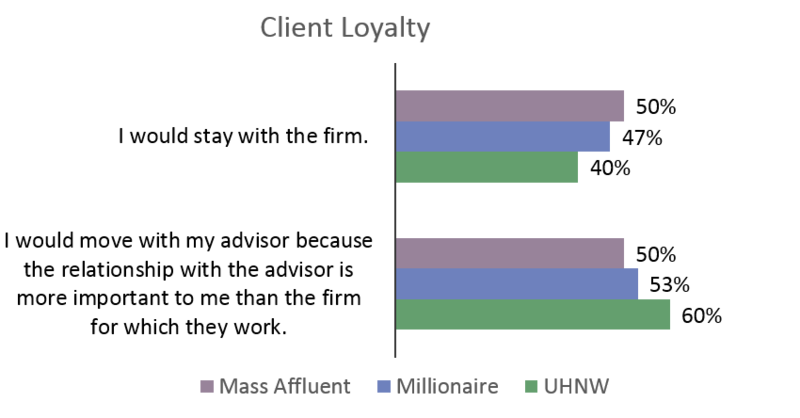 But client satisfaction is not directly translated into client loyalty, as shown by the questions asked in the Spectrem Group study to determine how tight a client is with his or her advisor. When asked whether they would move to a new firm if their advisor changed firms, under 60 percent of investors said they would. Those that would move with the advisor said the relationship with the advisor is more important than the relationship with the firm for which he works. However, among investors who said they were either satisfied or very satisfied with their advisor, 61 percent from all wealth segments said they would move with their advisor, an indication that there is some correlation between satisfaction and loyalty.